This year marks the 400th anniversary of Shakespeare’s death and has been dubbed “The Year of the Bard”. In light of this and the delightful coincidence that we have a program called BARD, the LBPH Annual Volunteer Luncheon featured guest speaker John F. Andrews, a native of Carlsbad, NM. He is the founder and president of The Shakespeare Guild and served for ten years as Director of Academic Programs at the Folger Shakespeare Library, where he edited the Shakespeare Quarterly magazine. It was an enjoyable and educational presentation with discussion of the various scholarly interpretations of Shakespeare’s word choices. 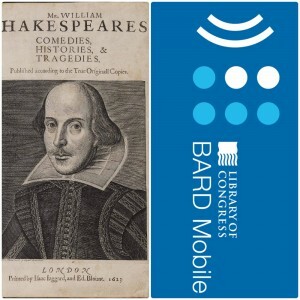 The National Library Service’s (NLS) use of the acronym BARD to describe its Braille and Audio Download book service provided us with a tangential relationship to Shakespeare and a great theme to our luncheon. The other NLS affiliations with the works of Shakespeare date to the first talking-book titles produced in 1934. In 1938, the Books for the Adult Blind project produced twenty-five plays recorded with full casts of actors, ranging from Sophocles to Thornton Wilder and Shakespeare. Currently, the NLS catalog includes 35 works of Shakespeare many of which are available to download through BARD. is shared by the three cassette machine repairmen in the Santa Fe office, working together in this configuration since 2008. 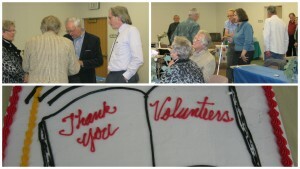 Honors were shared by Bob Peck, Daniel Koenig and George Auchampaugh. We do appreciate the skill these gentlemen have shared in doctoring old cantankerous cassette machines for so many years. Their time and energy is appreciated. The luncheon buffet was catered by Joe’s Diner. Our thanks to the Friends of the Library for hosting the event and for all that they do for us in the library year round.